First and most important – Happy Birthday Leslie! OK, now an update. We arrived at San Cristobal Island in the Galapagos mid day on the 21st. We got checked in and are allowed to keep our boat here only 20 days, so we have much to do and as always not enough time. There aren’t too many boat chores, but a few important ones like refueling and changing the engine oil. Sadly we motored the entire trip down from Costa Rica, so today Rob & Axel are going around finding enough jerry cans to borrow to get the refueling done in a reasonable amount of time. We have a permit that allows us to buy fuel tomorrow for $2.00 a gallon. If we have our agent provide the fuel he’ll charge $3.45 and won’t refuel us until the day before we leave. So Brit & I will spend a day shuttling the boys and jugs back and forth and collectively we’ll save about $400 refueling Yohelah and Hello World. Rob & I returned late yesterday from a 4 day boat tour around to the other islands. Why we get off our boat and take a boat tour I’m not sure, but that’s just how it happens. We were part of a group of 15 on a tour that included a guide, all transportation, hotels and meals. For 4 days it was $440 each, which in our opinion was worth it completely. The group consisted of one additional pair of yachties and 11 other folks that all knew each other. There were 7 young people from a volunteer bio-reserve station that were here doing work to help clean out invasive plant species that have been introduced to the Galapagos from other areas, along with some relatives of one of the volunteers. They were all really nice and we enjoyed the group as much as the tour. The first day we left early in the morning and made a bird watching and snorkeling stop at a couple of small uninhabited islands on the way to Floreana Island. Then at Floreana we had lunch at the home of a local family and took a truck up to the highlands to a tortoise reserve and some springs and caves. Then back onto the boat for a quick passage to Isla Isabella where we spent the night. The next morning we went to a tortoise breeding center and then up to Volcan Sierra Negra, where we had a 5 hour hike in the hot Galapagos sun. We hiked up to the edge of the volcano, which has the second largest caldera in the world, nearly 10 kilometers across. We went around the caldera a bit and down across some volcanic formations to a fissure where I think you could see right into the middle of the earth. Then back up to the caldera rim for lunch and a 1.5 hour hike back down to the bus after lunch. Needless to say, we were completely exhausted. But after the hike we went back out to see marine iguanas and snorkel with penguins. We saw lots of the swimming iguanas, which are endemic to the Galapagos (meaning they only exist here in the Galapagos and nowhere else on the planet). Sadly, the only penguins we saw were ashore and they weren’t in the mood to snorkel with us, which was unfortunate because Rob was dying to see what their little snorkels looked like. Day three took us back to the boat for a a snorkeling stop and then to Isla Santa Cruz, the island with the biggest town. There we had an awesome lunch, a tour of some lava caves and then to the park to see the giant tortoises “in the wild”. That was followed by a stop at the Charles Darwin Research Center where we saw Lonesome George. George is lonesome because he’s the very last of his species and was rescued and brought to Santa Cruz many years ago. Given that these tortoises live well over 100 years he’s been lonesome for a long time and his species will be extinct once he’s gone. Attempts to produce offspring have been unsuccesful as different species are not fertile together. 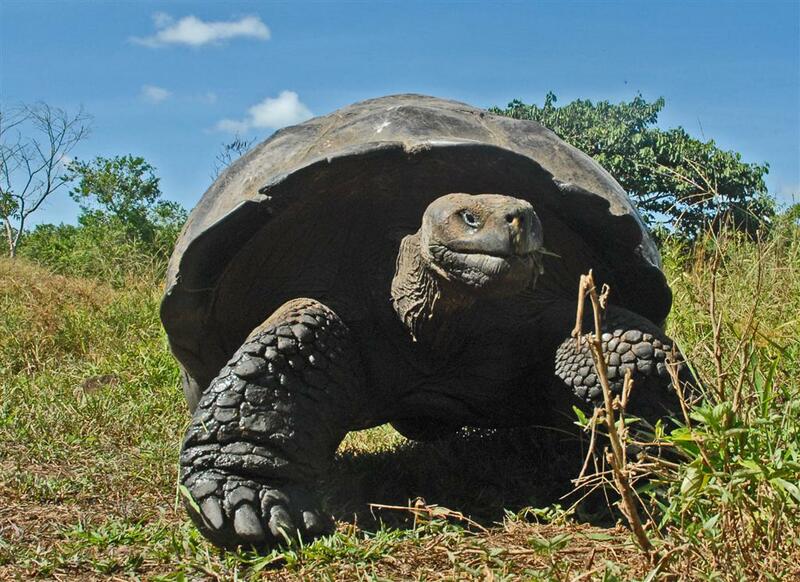 Three species of tortoise are extinct from three islands because of a volcano on one, invasive introduced species like rats and cats eating eggs on the other islands, and primarily from sailing ships taking live tortoises for meat. Day four was a trip to a beach that Rob & I skipped so we could get some shopping done. I had accidentally dropped my scuba weight belt off the back of the dinghy in Cocos and needed to find a new belt and weights, along with some other miscellaneous and very difficult to find items. After one last lunch it was back on the boat and back to Isla San Cristobal. Neither Rob nor I have ever done multi day guided tours before and we have to say we totally enjoyed it. Anyone coming this way should look up Manolo at Sharksky Tours for a very busy but fun four days. We’ve been keeping an eye on the winds between here and the Marquesas and it’s been pretty ugly. Before we left on our trip we heard about a boat that had been 5 days from the Marquesas for 10 days. There are just huge holes out there with nearly no wind. The forecast file I got today looks much better and is showing about 10 knots of wind just 300 miles south of here. Hopefully it’ll keep filling in between now and the 9th when we have to leave. With good tradewinds it’s a 20+ day passage for us. With really light and flaky winds it’ll be a lot longer than that. Hopefully before then we’ll get all the pictures and videos uploaded from our stop here and at Cocos. We’re busy with chores and friends and scrambling to find some insurance since the broker we’ve been working with completely screwed up and dropped the ball and has left us uninsured at the very last minute. Anyone considering Anchor Marine in Seattle should find another broker. Today on Yohelah we are a combined 100 years old and still recovering from our volcano hike 3 days ago…..